From humble beginnings as a small family business back in 1915, Dux has grown into one of Australia’s main providers of hot water systems. Prioritising product quality through an emphasis on research and development, Dux has been able to provide Australian homes with systems that are claimed to surpass expectations and lower bills. Currently based in the NSW highlands, Dux strives to be on the cutting edge of technology and at the forefront of customer satisfaction. Check out Dux’s range of products below. Whilst not big on variety, Dux does offer some solid options for households after gas storage systems, with the company offering a minimum 7-year warranty, and its gas systems not dipping below a 4 star rating. The Prodigy system, split into 4 star and 5 star ranges, has two options per range – the 135L and the 170L. These systems are available on propane gas and natural gas, giving households in different areas options for use. The 4 Star series is claimed to be the market leader in first hour capacity and recovery rates, with Dux making sure its customers are getting value for money. With the tank’s design, the Prodigy series is built to be an easy replacement unit for older models, making it one of the go-to models for those who need a quick replacement, particularly those in medium to large households. The 5 Star series are more efficient, with a 10-year warranty on all models. The increased efficiency comes from Dux’s patented flue damper design, which reduces heat loss, ensuring that the unit runs more effectively, and saves household’s money on their bills. The largest range on offer from Dux, the ProFlo series offers a variety of systems to suit all households, ranging from 25L to 400L. As with the Prodigy series, Dux offers a minimum 7-year warranty on the ProFlo series, with the larger models sold with a 10 year warranty. Available for indoor and outdoor installation, the ProFlo systems are built to last with polymer bases, vitreous enamel and anodes to resist harsh Australian conditions and climates. The smaller and larger options also come with additional varieties, making it more personalised for individual households, with all but the largest models available under $1000. Available in both condensing and non-condensing models, Dux offers a variety of continuous flow models for the energy-efficient diehards, with none of the models falling under a 6 Star rating. Dux also offers a 12-year warranty with condensing products, meaning that you’d be hard pressed on finding a reason as to why you shouldn’t consider them as an option for your house. Offering 17L, 21L and 26L options for the non-condensing range, these products are said to be better suited for smaller households, but still have enough grunt to easily deal with those long showers. The condensing models, which use a second heat exchanger to lower the exhaust temperature and reduce waste, comes in 21L and 26L models, with accessories available for all models. Like most hot water providers, Dux has also ensured that it offers solar boosted systems, allowing for households to maintain savings and be a bit more environmentally friendly. Providing both electric and gas models for solar powered systems, Dux has provided options to suit everyone. The Sunpro contains a split system design which provides flexible installation without the need to reinforce the roof, meaning that households will just have to pay for the system without altering their house, which reduces the stress when it comes to installing a new system. With a patented Hotlogic processor, Dux’s solar systems are able to maximise the energy from the sun to ensure that households are also maximising their savings. Combined with the multi-temperature sensors on their vitreous enamel tanks, Dux has reduced the risk of overheating, giving consumers peace of mind for those still unsure about solar energy products. The electric system range has three options, ranging from 250L to 400L, which would be suitable for the majority of households. The 400L model also comes with a third panel, maximising the energy potential for larger households. In comparison, the gas range only contains one model, a 315L tank with 2 solar panels, but also includes a low megajoule consumption burner, an indicator of Dux’s energy saving intentions. Both ranges also come with a 5 year warranty for both the tank and the panels. 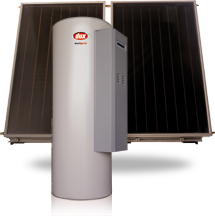 If your household isn’t suitable for solar panels, not to worry, as Dux also offers Australia’s most highly awarded environmental heat pump – according to Dux that is! With a capacity of 250L, the Airoheat uses a patented in-tank heating coil to heat the water using outside air. Working like a fridge in reverse, the Airoheat may be your most environmentally-friendly option if you can’t install solar panels. The Airoheat also comes with a 5-year warranty, with Dux also including a composite condensation tray for rapid and effective drainage for high rainfall areas, as well as dual anodes to provide greater protection against any tank corrosion, and obvious indicator that the company understands the Australian climate. In addition to all of this, the Airoheat is also eligible for government rebates, so be sure to contact your local provider. 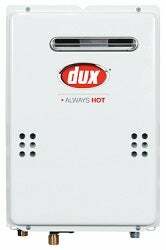 Is a Dux hot water system worth the money? When it comes to household necessities, hot water is usually near the top of the list, but as to which water system you go with can often come down to individual scenarios and households. Water usage, household size, location and climate can all be big factors in which company and model you go with. Dux offers a good range of products, and is competitive on prices, with enough variety and guarantees to give households peace of mind as well as savings. It’s always recommended to research before you buy, with hot water systems no exception, as it is a big decision and investment. Regardless of your ultimate decision, Dux is worth checking out, as you might just find the perfect fit for you.